Whether you want to store your own garden-grown produce or whether you want to take advantage of a bulk discount for fresh vegetables from a local farm stand or farmer’s market, one of the most important things to know is how to properly store those vegetables for the winter. Storing produce for the winter is something we don’t always think about today since we have the option of running out to the grocery store anytime we want, but our ancestors had to plan carefully for winter storage to make sure they would have a well-preserved food supply to last through the winter without spoiling. Even though it might not be a life-or-death necessity to know how to store your own food for winter, knowing about some basic food storage guidelines is a good old-fashioned skill to learn if you want to be able to save money by buying in bulk or by growing your own food or even if you don’t want to waste the produce you get from the grocery store. Though some vegetables were either preserved by being canned or dried, many vegetables were kept fresh for months in old-fashioned root cellars. The root cellar was the ideal temperature and moisture level for most vegetables that grew below the ground. Root vegetables like carrots, parsnips, and turnips were usually stored in bins filled with river sand. (Beach sand has too high of a salt content and could dry the vegetables out.) The vegetables were laid out so that they weren’t touching one another, and then they were covered with a layer of sand, and then the rest of the bin would be filled with alternating layers of vegetables and sand. Potatoes were usually stored in separate barrels or bins without any sand, and every couple of weeks someone would sort through the potatoes to separate out any that were starting to form eyes, and those would be used up first for eating. The bins for the root vegetables would also be sorted through to make sure that none of the vegetables were starting to spoil. Winter squash and pumpkins were typically kept inside the house because the root cellar was usually too cold and too humid of an environment for them. It was actually common for squashes to be stored underneath the bed or tucked away in any empty corner that could be found, and during the harvest season, families were often tripping over the abundance of squash they had grown in their gardens. Our modern trend of decorating with squash and pumpkins probably started from the practical storage practice of keeping squash inside for the winter months. Note: Even though plastic bags may not be ideal from an eco-friendly standpoint, they’re an effective way to preserve the vegetables, and you only need to use one bag to keep the vegetables fresh for months. Note: Cold temperatures can alter the flavor of the potatoes because the starches start converting to sugar, so it’s best to keep them at room temperature for about a week or so before using. Cool, dry conditions (between 32-55 degrees and about 50-60% humidity) can usually be found either in a cellar or out in a garage. Or, if you live somewhere with cold winters, even an unheated porch might be a good environment. The main thing for these vegetables is to avoid too much moisture, so you wouldn’t want to store these in plastic bags. Mesh bags are ideal to allow for air flow. Warm, dry storage conditions (about 55-60 degrees and 60-70% humidity) can usually be found in most homes at room temperature. 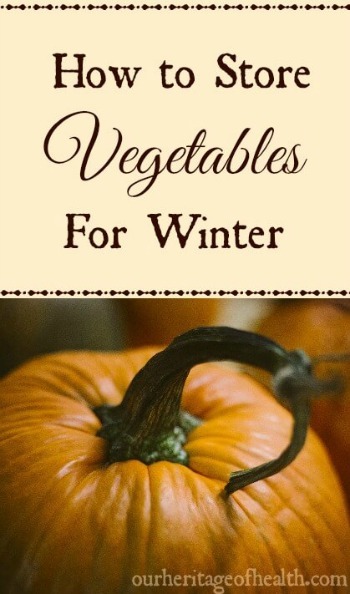 You would want to keep these vegetables in the main part of the house (rather than in a cold cellar or garage or porch) so that they won’t be too cold during the winter months. Any out-of-the way place will work. You can even do it the authentically old-fashioned way and keep them under your bed if you want! Apples keep well in a place that is both cold and moist, but they should be stored away from other vegetables if at all possible. The ethylene gas they give off can make other vegetables start to spoil much more quickly, so it’s best to keep apples in a separate place from vegetables. 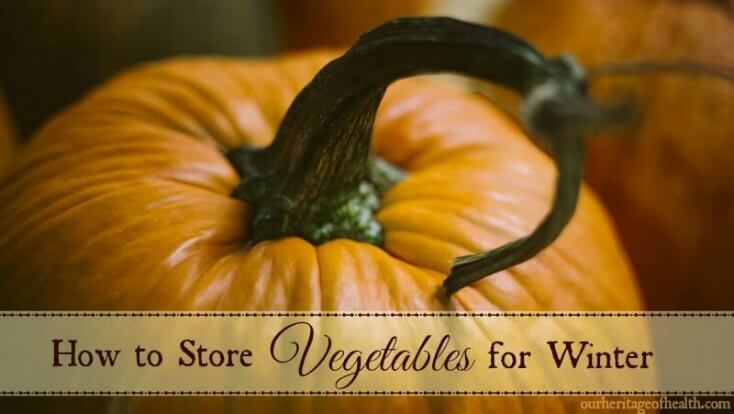 What other tips do you have for storing vegetables for winter? Let us know in the comments! I have to say I fell in love with your blog today !!! I saved it and shared today anywhere I could ! 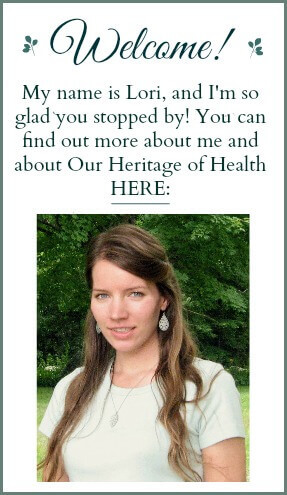 Even on my own blog ! Will return and I did subcribe !